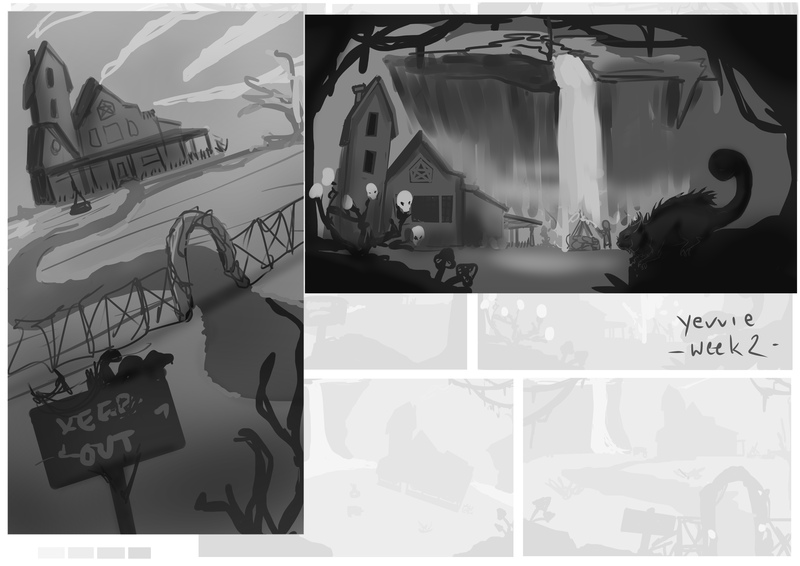 Loved your thumbnails and i agree, no.6 feels to have a better composition and with alot of elements and details. 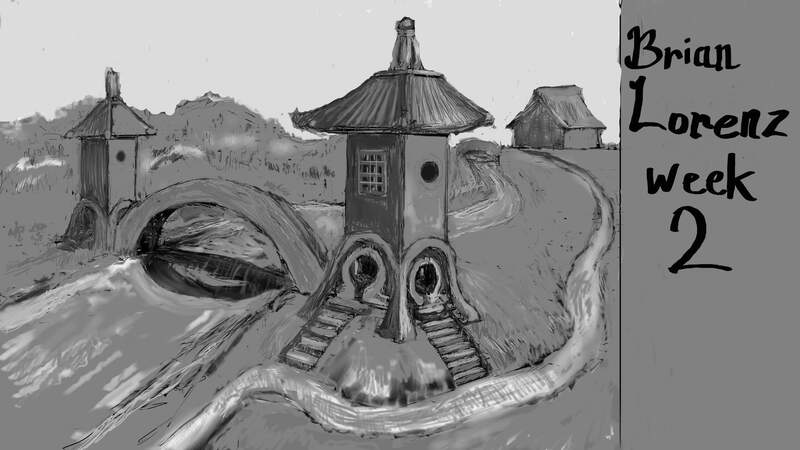 Also you go from dark grey to very light grey smoothly what gives an the idea of big depth. Hey guys! 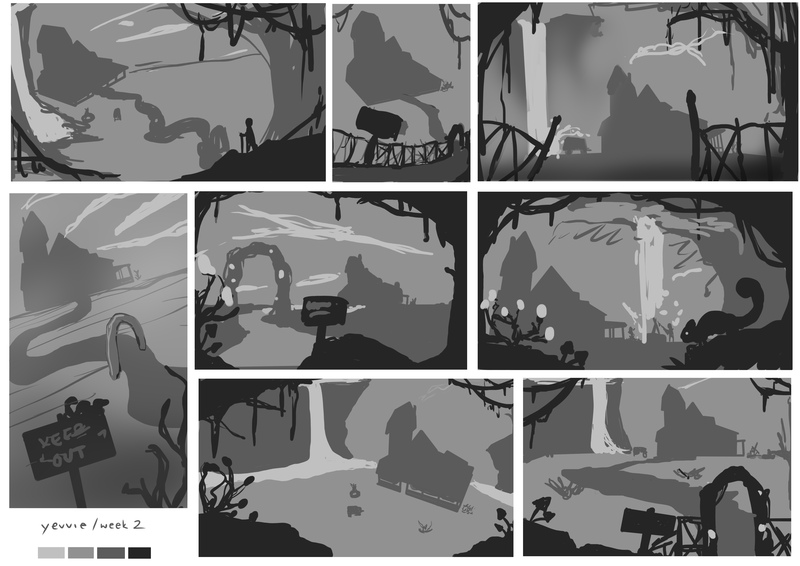 Here I post the thumbnails I created for week 2. 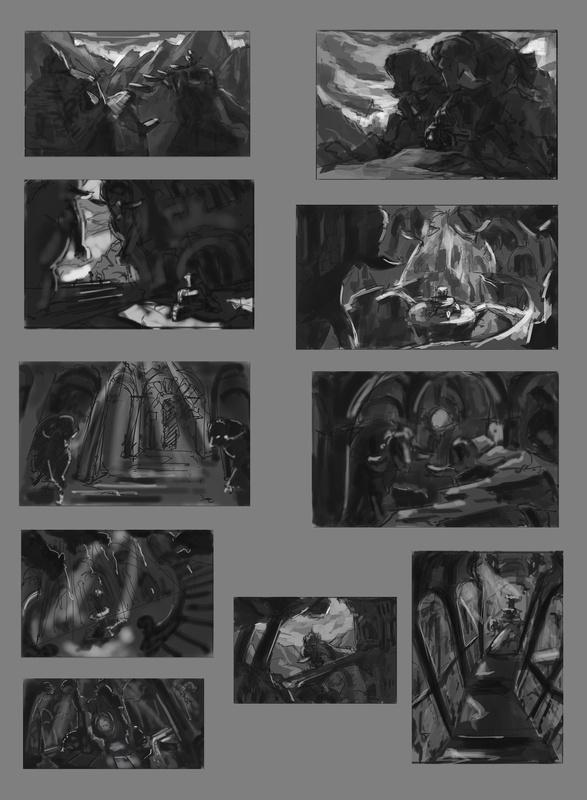 My first idea was to create an evil atmosphere, kind of an interior with a devil spirit inside, as in the 1 and 2 thumbnails. 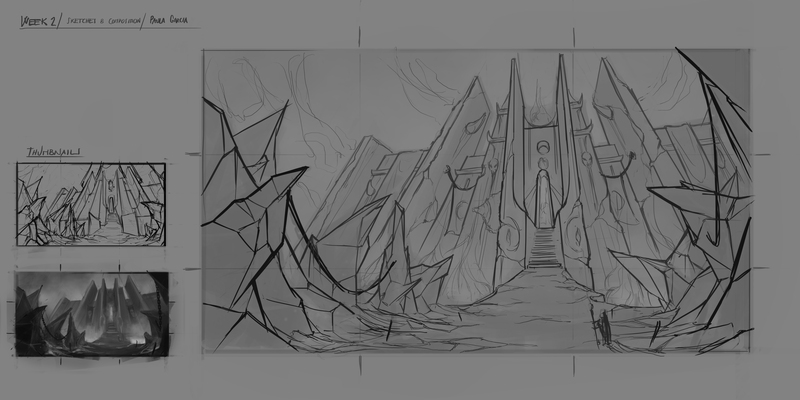 But exploding that idea made me imagine an exterior with a creepy rocks and lava and putting on the focal point the entrance of the devil fortress. 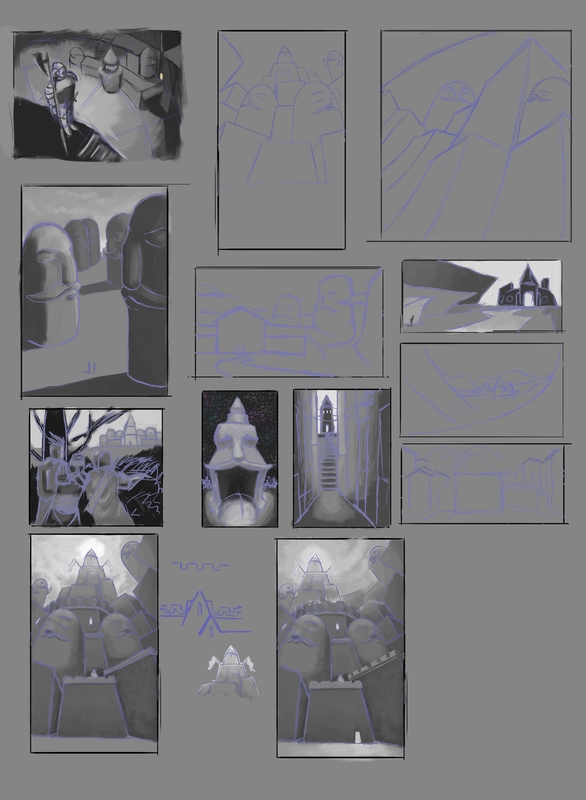 So I chose the last thumbnail to go further these coming weeks. 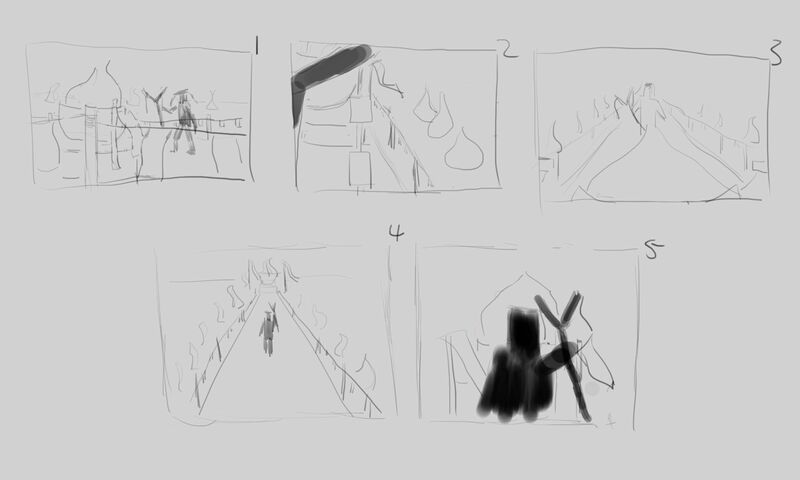 So my drawing skills haven’t improved much but hopefully my thumbnails are at least somewhat intelligible. 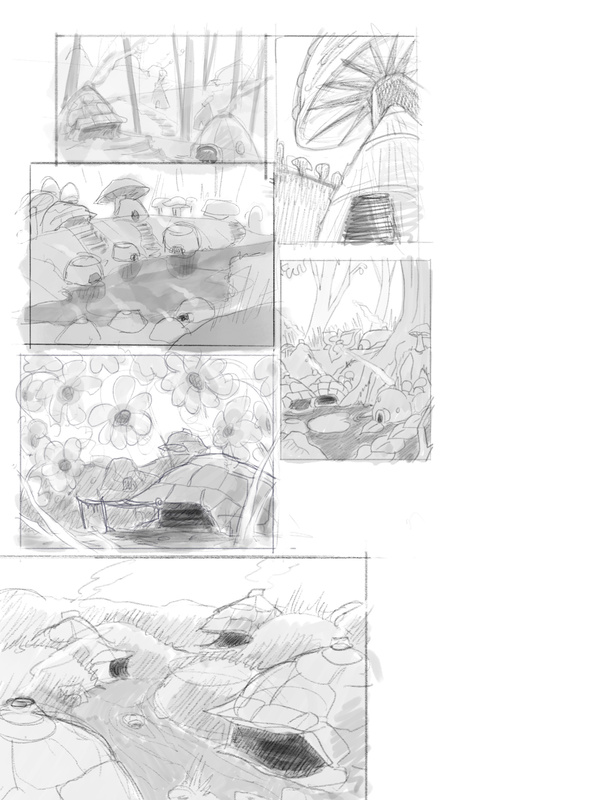 I’m going for a ceremony scene with spirits on either side viewing (that’s what the bloby things are). 1 is supposed to be a side view, 3 a front view, and 4 and 5 from behind. 2 was an attempt at the camera being behind the staff but in front of the person, I don’t think it went very successfully though. 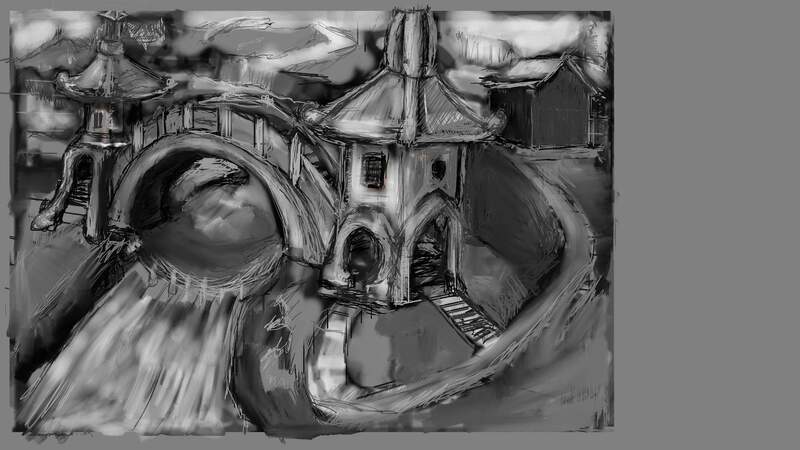 Currently I’m leaning towards 1 or 4, but I’ll probably need to think of stuff to add to the foreground/background since it still feels empty. Hey all, how’s it going? Hope you are having an amazing week! 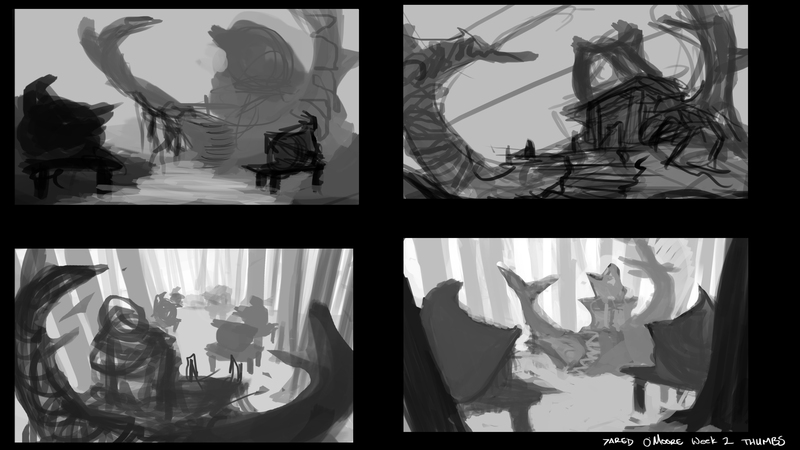 So, following the concept of the brazilian native culture with a fantasy twist back from week 1, I’ve come up with those 5 thumbnails after giving some thought of what kind of story I’d like to tell. So I’ve selected those 5 that bring different kind of moods to work on. 1 - 2 people in a balcony, talking or singing as the fisherman come back to the tribe in the river that goes in between the roots of the tree that supports the city. 3 - up in the city, high above the ground, two kids would be playing music unter the shades of the leaves, while alduts in the distance would do their chores, there’s a thirst child on the rope bridge that would join them. it’s a more cheerful scene that brings out the musicality and joy of the people that live there. 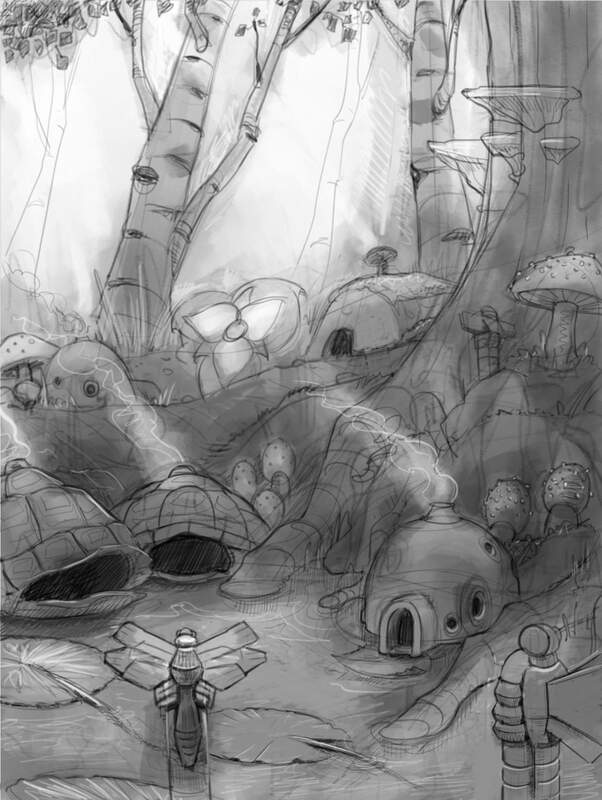 4- explorers reach the vertical city on the massive tree, i was intending for it to be more of a mysterious mood of discovery. 5- A mother and her child visit the alter with the cerimonial urns of their ancestors, they climb the stairs made out of wood and stone, with carvings of their gods in celebration of the cycle of life. down the stairs, there are a nother set of stairs that lead to another balcony with a sleeping net, where more people are about their lives. In the background you can see another balcony from another tree, clouds and birds to indicate how high they are. I hope I made myself understood despite my English, thanks all for reading 'til here. I was worried I won’t make it in time! 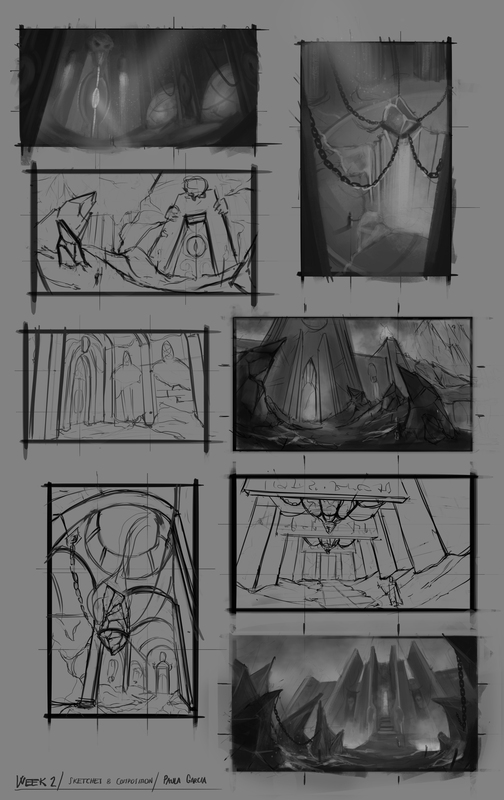 I’m still mulling over some ideas so the concept changes a bit with each thumbnail, so I haven’t settled on one thumbnail to develop further. 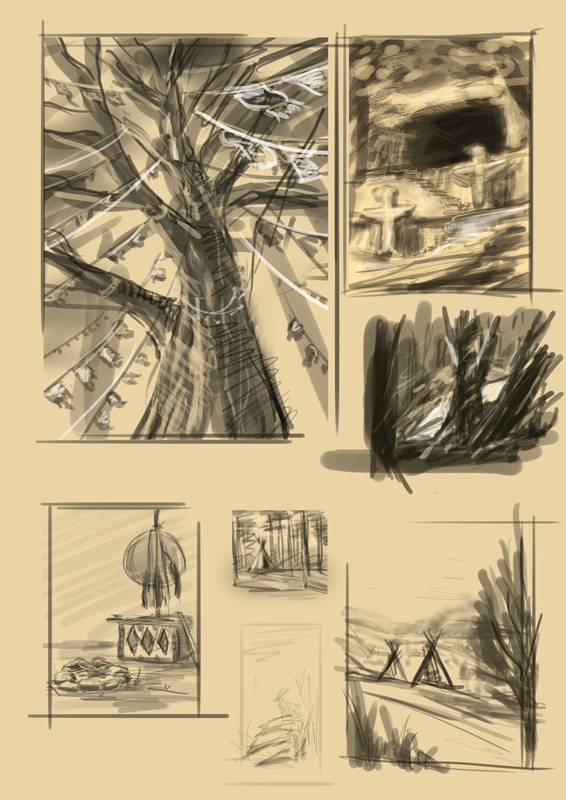 I’m steering towards making the huge tree part of the temple itself and making the tree a gaurdian figure in the form of a dragon. 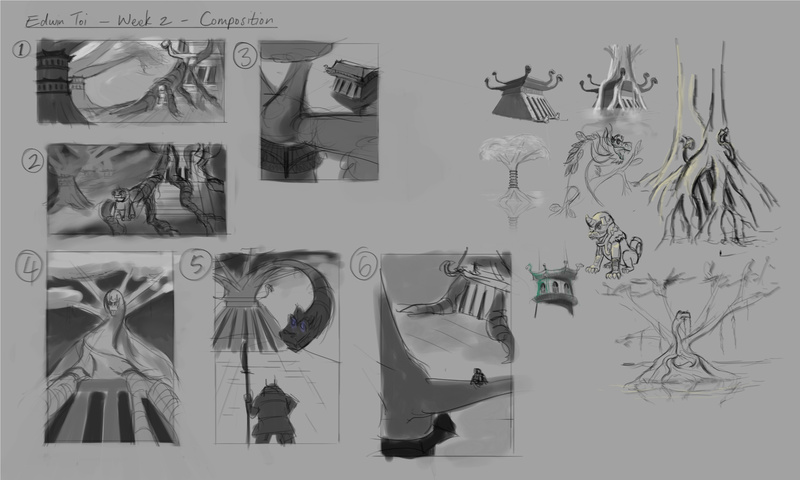 So far, number 4 is my favourite as it made the dragon tree look the most imposing. 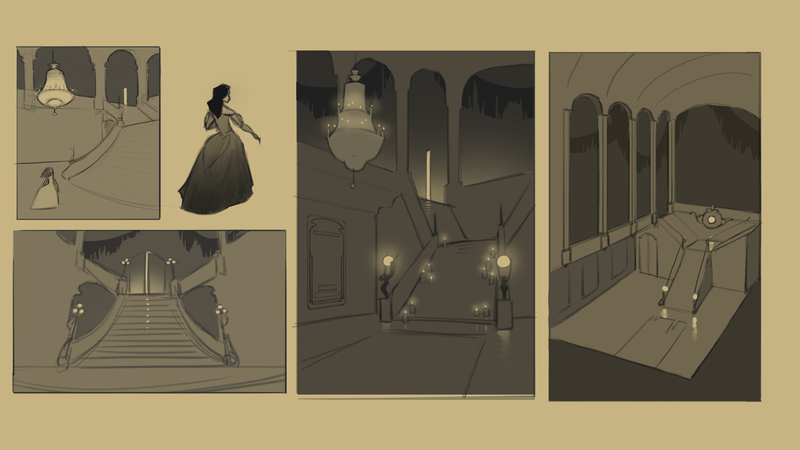 I’d love to work on more, but I’ve run out of time. Comments and critique are most welcome. 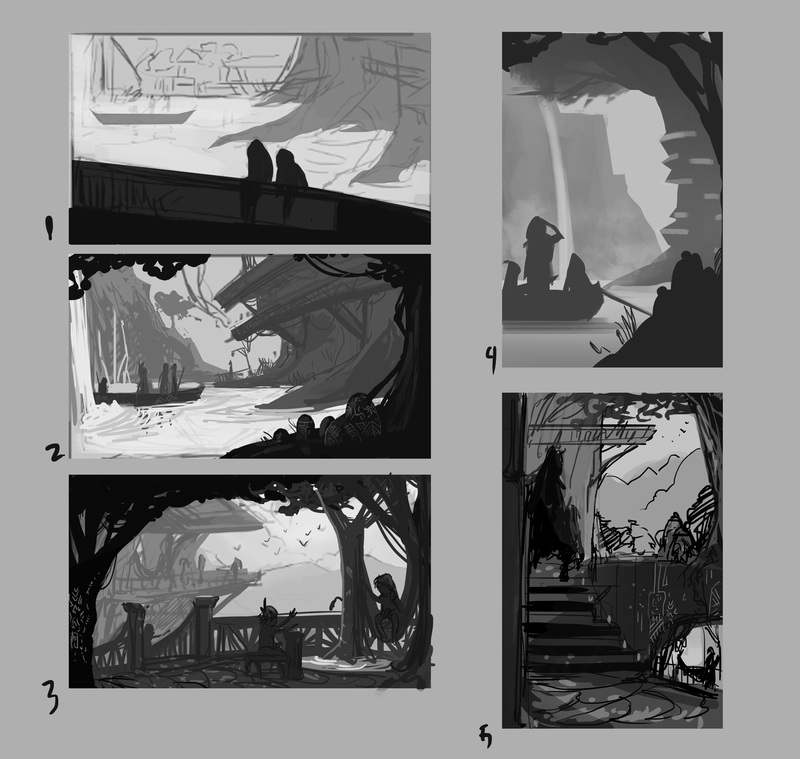 So I am running on incredibly short spaces of time due to end of year college submissions so I am going to upload really sketch thumbnails and hopefully I can catch up once my college year is done in a few days So let me know which one looks cooler to you because I am not sure which one I am going to work on yet. 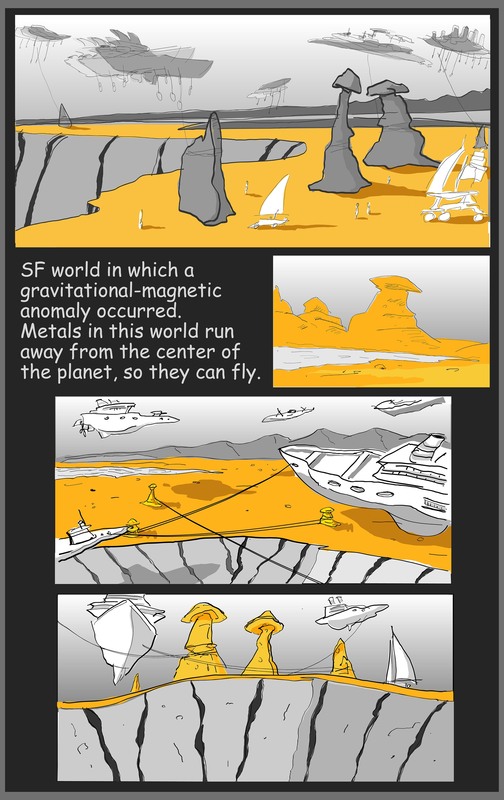 SF world in which a gravitational-magnetic anomaly occurred. Metals in this world run away from the center of the planet, so they can fly. 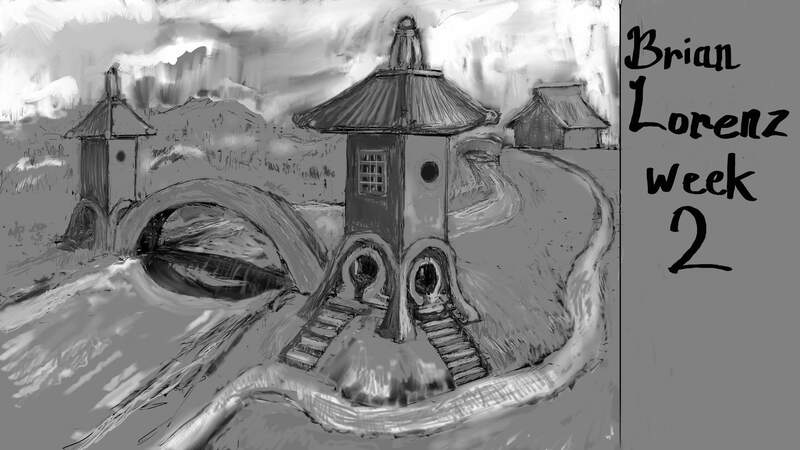 I painted my self into a corner (bottom) and redrew the image (top and middle). 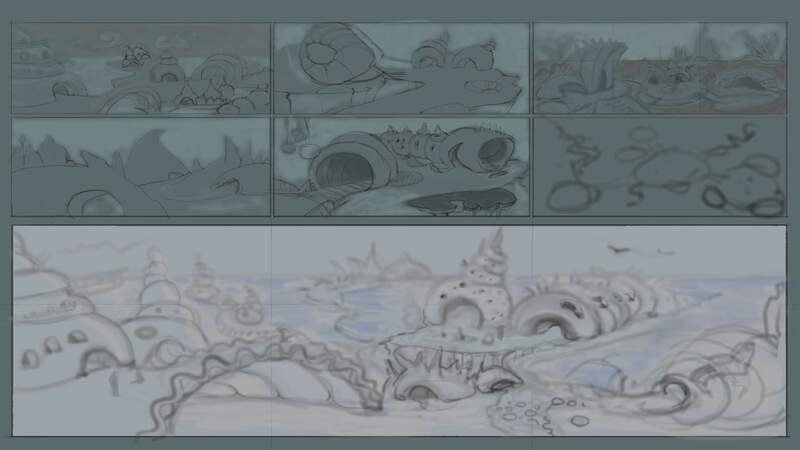 I did some experimenting with with clouds and fog. I think that was partially successful. Overall I am pleased with the results. I would appreciate any feedback. The light blue on grey is hard to see. I would go with the bottom right. It has a nice rhythm to it. Hi. 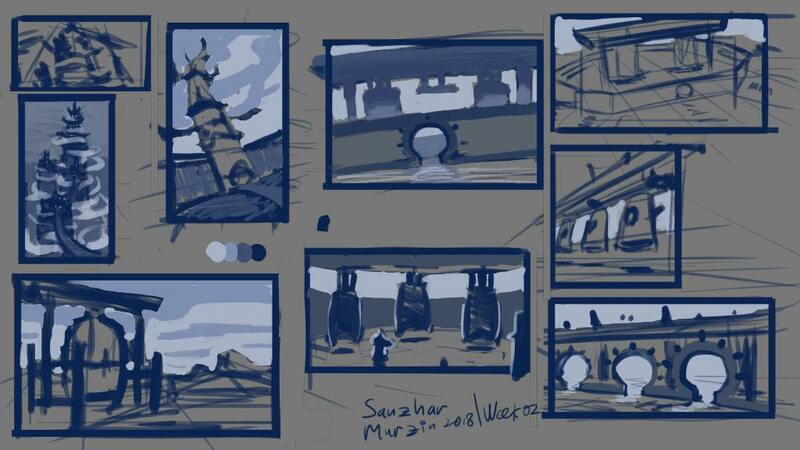 Here are sketches for week 2.